who was conceived by the Holy Ghost, born of the Virgin Mary, suffered under Pontius Pilate, was crucified, dead and buried. He descended into hell; the third day he rose again from the dead; he ascended into heaven, and sitteth on the right hand of God the Father Almighty. From thence he shall come to judge the quick and the dead. I believe in the Holy Ghost, the holy Catholick Church, the communion of saints, the forgiveness of sins, the resurrection of the body and the life everlasting. Amen. The God of Jewish and Christian belief is the Creator of the universe. As such, He (or It) might be thought of as an impersonal Power, working inevitably to produce the world we see. When we call that Power “Father”, we affirm our belief that this Reality is not impersonal, but is wise and benevolent, acting with purpose, a purpose which has our welfare at its heart. It follows that the world we live in is fundamentally good, and that despite any and all appearance to the contrary, this is something we must hold on to. God loves us. We matter to him. The essence of Christianity is its belief about Jesus. Jesus is an historical figure, a Jew who lived two thousand years ago. The title “Christ” is the same as “Messiah”, meaning “anointed”. Among those who were anointed in ancient Israel, the most important were the kings, from Saul and David onwards. The prophets spoke of Israel the nation as God’s “son”, rescued from slavery in Egypt (“Out of Egypt I have called my son”). The king represented the nation, and so he too was referred to as God’s son (The words of Psalm 2, “You are my son, today I have begotten you,” originally were used at the coronation of the king). After the Exile in Babylon, when the line of kings ceased, the Jews hoped for a future king who would be “Messiah” and “Son of God” par excellence. Christians believe these hopes were fulfilled in Jesus, whom we recognise as “Christ”, and acknowledge as “our Lord”. In the longer Creed we use at Sunday Mass, we add that he is “God from God, Light from Light, true God from true God.” God is not (the Church came to understand, on the basis of Jesus’ own teaching) simply “Father”. The Wisdom of God, his “Word”, personally became human, became one of us, to unite us to himself. It is part of the Catholic faith that when God became man he entered the world just as we all do, carried for nine months in the womb of his mother before being born. Yet his conception was not due to any human activity, but entirely due to God’s own initiative. Jesus had no human father, although in Mary he had a human mother. Jesus and Mary together, as a new Adam and a new Eve, initiate a new humanity, into which we can all be “reborn”. suffered under Pontius Pilate, was crucified, dead and buried. Although the Creed does not yet mention it, it takes for granted that God’s good creation has (at least as far as the human world is concerned) been spoiled by human selfishness and sin. This is the more profound slavery and exile that were reflected in the history of Israel. Jesus has come to save us from the consequences of human disobedience, through being utterly obedient to God, even when that led to rejection, torture and death on a cross. This salvation happened at a specific and unrepeatable point in human history, under the Roman governor of Judaea, Pontius Pilate. “Hell” here means simply “the place of the dead”. Christ’s death was not just a fiction or illusion. He really died, just as we will, and he remained dead for two days. On the third day, he rose again in bodily form, but without the weaknesses of our present existence. We are thereby assured that death is not the end: and so our hopes and ambitions (and fears) should not be limited by this present life. he ascended into heaven, and sitteth on the right hand of God the Father Almighty. Jesus lives; but, for the time being, in a way we cannot immediately perceive. He is enthroned with God, he is the divine human who rules the universe. Our challenge and task is to proclaim the Kingship of Jesus, setting before our fellow-men the Good News of his conquest of death, with the main proof being the difference it has made to our own lives. The Holy Spirit is God Himself, but in the “Person” of that love or benevolence mentioned above. The Spirit is the “Breath” of God, the Father’s outpouring of Love, indeed the mutual Love binding Father and Son together. It is this same Love that God has towards his creation, and by which he inspires human beings to love him and one another. We live and act “in the Spirit of Jesus”, another way of referring to the same Reality. The Church is “the blessed company of all faithful people”, who have put their faith in Jesus and have been baptised. It is meant by our Lord to be united in faith and love, cared for by pastors whom he himself has commissioned through Ordination. Sadly, it is now divided within itself, regarding teaching, behaviour and pastoral authority. The term “Catholic” refers to what historically has always been “main-stream” Christianity, as held by the Church down the centuries. The “communion of saints” refers both to the unity in holiness of believers on earth, and to their continuing fellowship with those who are now with the Lord, but who still care for us and pray for us: above all with our blessed Mother, Mary. Two important elements in the communal life of the Church are the Bible and the Sacraments (see below). Jesus lived and died in order that sinful humanity might be reconciled to God. Since sin is a spiritual wound in our souls, reconciliation is a kind of healing. We receive it in various ways, but one of its sacramental expressions comes through the “ministry of reconciliation” commonly called “Confession” (see below). Although we believe that when we die we go to be “with the Lord”, we look forward to a real bodily resurrection, like that of Jesus, when God renews heaven and earth. The “life everlasting” or “eternal life” that we believe in already belongs to us, since it is the Holy Spirit of God dwelling in us. This life is also called “grace”. Traditional Catholics (like traditional Evangelicals) believe the Bible to be the Word of God. The larger part of it (the “Old Testament”) is the record of God’s dealings with humanity, and especially with his People Israel, leading up to the coming of the Messiah. The story of Jesus cannot be properly understood without this. The “New Testament” consists of the witness of first-generation Christians to Jesus’ death and resurrection, and its ongoing implications. The Bible was written by human beings using their own idioms and understanding to express their faith. It grew out of a community (Israel) and should be interpreted within a community (the Church), avoiding over-literal fundamentalism and a liberalism that rejects its divine authority. A “sacrament” is an outward sign conveying an inner spiritual grace, instituted by Christ. The worship of the Church centres on two greater Rites, Baptism and Eucharist, and five other lesser rites. The Church has added to these other forms of prayer. Catholic Christians understand his words as meaning that, in performing this act of worship in the way Jesus commanded, they are truly united to and share in his sacrificial self-offering to the Father upon the Cross. They understand Jesus as meaning quite literally that the bread and wine so consecrated really are his Body and Blood, his living Presence among us. This Presence is not limited to the time of the service itself, but continues. The Blessed Sacrament is reserved in our churches, not simply for the practical purpose of taking it when necessary to those unable to get to church, but to be an abiding focus for our prayer and devotion to him. The outward sign of our beginning to be disciples of Jesus is Baptism. New believers (even children) are immersed in water, or have water poured upon them in the name of the Father, the Son and the Holy Spirit. By this action, a personal sharing in the life of Jesus is initiated, which is thereafter fed and sustained by the Holy Eucharist. Any Christian may baptise in case of need (a nurse in a hospital, for instance), because Baptism is so important. But being a Christian is not simply an individual relationship with Jesus, but being part of the community we call the Church. This full membership of the body is expressed in the sacrament of Confirmation, which is practised in different ways in different parts of the Church. 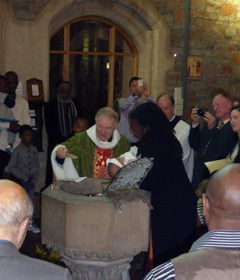 Normally in the Church of England, an already baptised person (perhaps baptised in infancy) comes before the Bishop who is chief pastor in an area, who lays his hands upon him or her and calls upon the Holy Spirit to strengthen that person in their Christian life. Elsewhere, an essential element is anointing with Chrism, an oil blessed by the Bishop and administered either by himself or by a priest representing him. In Eastern Orthodox churches, this is done by the priest baptising. In every case, there is a relationship to the Bishop and to the Christian community in which the Eucharist is celebrated and received. Although Christians are supposed to renounce sin and follow Jesus’ way of life, in practice we all fall short (sometimes even seriously). While we can always turn to our merciful God in sorrow and repentance, we may still feel anxious as to whether we are truly forgiven. We may then go to a priest and open our consciences, and he is empowered to pronounce authoritatively in the name of Jesus that our sins are forgiven. We can do this not only in the case (hopefully rare) of serious sin, but in order to receive God’s strength in overcoming our lesser faults. This is called the Sacrament of Reconciliation, or of Absolution, and commonly “Confession”. Sin is a spiritual sickness, but there is also bodily and mental illness. Our Lord has provided for these trials by the Sacrament of Anointing (“Unction”). This should certainly be sought in cases of serious illness, and not just left to danger of death. Two other Sacraments are used to consecrate Christians for particular vocations or ministries within the Church. These are Holy Matrimony and Holy Orders. Holy Orders (Ordination) is the Sacrament whereby someone is consecrated for the ministry of the Priesthood. 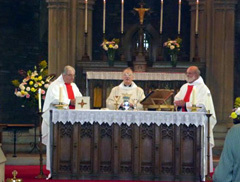 There are many ministries in the Church, formal and informal. The ministry of the Deacon is to assist the Pastors of the Church in worship and in the administration of charity. The ministry of the Priesthood has two grades, that of Bishops and that of ordinary Priests. The essential ministry of the Priest is to preside at the Eucharist, offering to God in sacramental form the Holy Sacrifice which feeds and sustains the Church. He is in a special way the representative and ambassador (Greek presbytes) of Christ. This even more true of the Bishop, who continues the ministry of the Apostles as the one who watches over (Greek episkopos) and unifies the Church under Christ, and leads it in worship. The unchanging tradition of the Catholic and Orthodox Churches is that neither marriage nor priesthood are “gender-neutral”. Marriage must be heterosexual; priesthood must be male, by the institution of Christ himself.